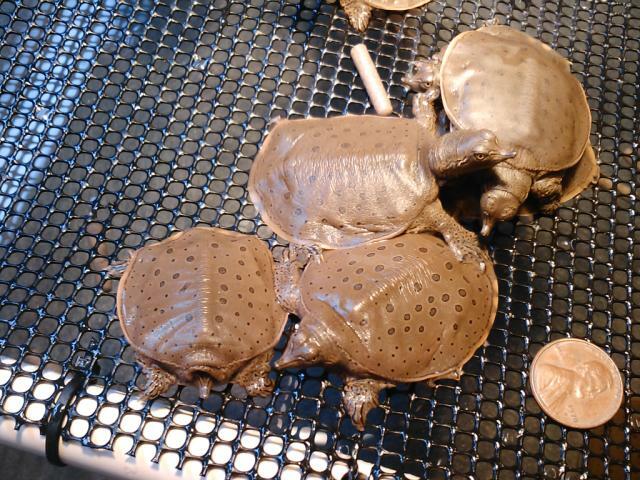 ECHO's 2010 Spiny Softshell Turtle Head Start Program has begun. On September 15, Vermont Fish and Wildlife Biologist Steve Parren dropped off 43 baby turtles ranging in age from one to three weeks. This is the third year ECHO will assist efforts to support this threatened species. The youngsters are on exhibit in the Animal Care Office located on the top floor of ECHO and are featured in daily Animal Encounter presentations for ECHO guests. Animal Care staff will care for the neonates through the winter. In June, they will be released back into their native habitat. If you're a member at ECHO, watch for an email from ECHO inviting you to participate in the release. Biologists estimate that there are less than 300 Eastern Spiny Softshell turtles in the Lake Champlain basin. You can be a good steward for the turtles by staying clear of turtle nest sites in the spring, summer and fall. If you're boating in areas where this species is known to occur, be on the lookout for their signature long skinny noses and avoid striking them. Help ensure the best possible water quality in Lake Champlain by reducing or eliminating your use of pollutants, fertilizers, pesticides or other substances that adversely impact water quality. If you want to learn more, visit ECHO, check out the Lake Champlain Basin Programs Resource Room, and while you're here, be sure to see our newest, cutest residents, the baby Eastern Spiny Softshell Turtles.